^ 駱芬美. 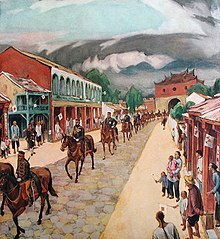 被混淆的臺灣史: 1861～1949之史實不等於事實. 時報文化. 2014-01-17: 112. ISBN 9789571358864 （中文（台灣）‎）. ^ 駱芬美. 被混淆的臺灣史: 1861～1949之史實不等於事實. 時報文化. 2014-01-17: 109. ISBN 9789571358864 （中文（台灣）‎）. 張省卿，〈以日治官廳台灣總督府（1912-1919）中軸布置論東西建築交流〉，《輔仁歷史學 報》，第19期，台北：輔仁大學歷史學系，2007年7月，頁163-220。July 2007, Chang, Sheng-Ching. „Exchange between Eastern and Western architecture from the perspective of the central axis alignment with the example of the administrative buildings of Taiwan’s governor’s office「, 「Fu Jen Historical Journal」, no.19; Taipei, Department and Graduate Institute of History of Fu Jen University, pp. 163-220.